Designed for extracting failed glow plugs. External grip (7.7mm internal Ø) Includes size 4 (6.0mm) contraction collet. 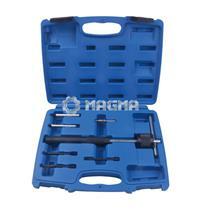 External grip (6.8mm internal Ø) Includes size 3 (5.0mm) contraction collet. Contraction collet: size 3 (5.0mm). Contraction collet: size 2 (3.6mm). Contraction collet: size 1 (2.7mm).